Tales from the Real OC (Really! ): The DARK FLAME Countdown Begins! i can't wait!!!!! im soooo excited!!! :) i loved the mini teaser too!! I am very excited! I was just wondering if the cover for Dark Flame changed? Kimberly- OMG-- just noticed that I used the mock-up cover and not the final cover!! Gasp! Good eye! My daughter, Chloe , is so excited for the latest book in the immortal series! Will you have a book signing any where close to Louisville KY? That would be a wonderful birthday present for her if you did. Why does Haven look different on this book cover?????? Anonymous- Because I accidentally posted the mock-up cover and not the real, photo shoot cover! btw where did you get your insperation for writing evermore?? Hi Taylor- Thanks so much--I'm thrilled your enjoying them! As for the inspiration, a few years back I lost 3 loved ones in 5 mos & almost lost my husband as well. Going through that time of grief got me thinking a lot about life & death, mortality & immortality, and the bonds we feel with our loved ones long after they're gone, and Ever & Damen's story was born from there! Ozsansama- Thanks! Hope you enjoy it! Anne- So glad you enjoyed them--hope you enjoy the rest of the book too! i'm sooo excited for dark flame and radiance!!!! i love the series!!! :) do you know how many books there will be in the series yet? Susan--Waving!! Thanks for stopping by! Miranda- Thanks! There will be 6 books in The Immortals and 4 in Riley's series! Hi Taschima- Thanks so much for reading Radiance! You might want to wait until late August, early September since it comes out on 08.31 and it will be more relevant then, but, it's your blog, so whatever you chose to do is fine by me! 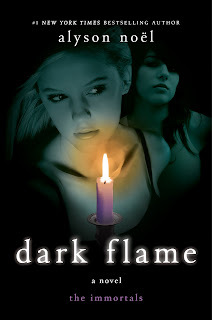 Finally "Dark Flame" is comming out. Im so excited with this news. You made me very happy wiht this post. I thought there was only 6 books in the Immortals Series? Anyways, I absolutely adore your writing Alyson, you're my open inspiration! EVERMORE, BLUE MOON, SHADOWLAND, DARK FLAME, NIGHT STAR, & #6 (no title yet!)! I found this one on the book. Chapter 3, the last sentence!